Sounds delicious. Am going to try it this weekend. Thanks! Oh good! Let me know how it turns out Heike. It looks so inviting! Such a wonderful idea! I love it!!! This cauliflower looks delicious! My hubby thinks he doesn’t like it but this would be perfect to make when he’s not home. I didn’t like cauliflower for years and now I can’t get enough of it. Strange. Maybe it had something to do with the way my mom prepared it. Just boiled, no sauce, nothing. :/ Thanks Julie! I think that is true of a lot of old school dishes. That and they say our tastes change every 7 years. This looks amazing. At first glance I thought it might be crumbed with its deep golden crust. What a brilliant idea. You’re right. Just took another look at the photograph and it does look crumbed! What a nice comment…thank you! This looks great! I have never tried roasting a whole head of cauliflower. The sauce sounds really wonderful too. I will have to try this soon. Do you know if your posts will appear in my reader if I sign up for email notifications on your blog? Yes that’s what I thought I just didn’t see a “follow” button on your site. Makes sense knowing you are self hosted. Let me know! I’d love to read your posts hot off the press! Thanks so much–I will look into it and get back to you. Hi there, I found a link to show you how to follow a non-wordpress.com blog by adding it to your wordpress reader list. It is here: https://en.support.wordpress.com/reader/#adding-new-blogs. Thanks for the interest. I really enjoy your blog! Having spiced cauli for sups, if I ever get the caramelised onions finished! So I can understand why you’re posting this. Cauli’s are so good with spices. Even, like mine, pan-fried on the hob. They’re so easy to deal with. Plus, they’re incredibly healthy from what I’ve read. You’re a class act! :) Thanks! I grew up in the plain boiled cauliflower era too and loathed it until I tried it raw, now I love it cooked every way BUT boiled. 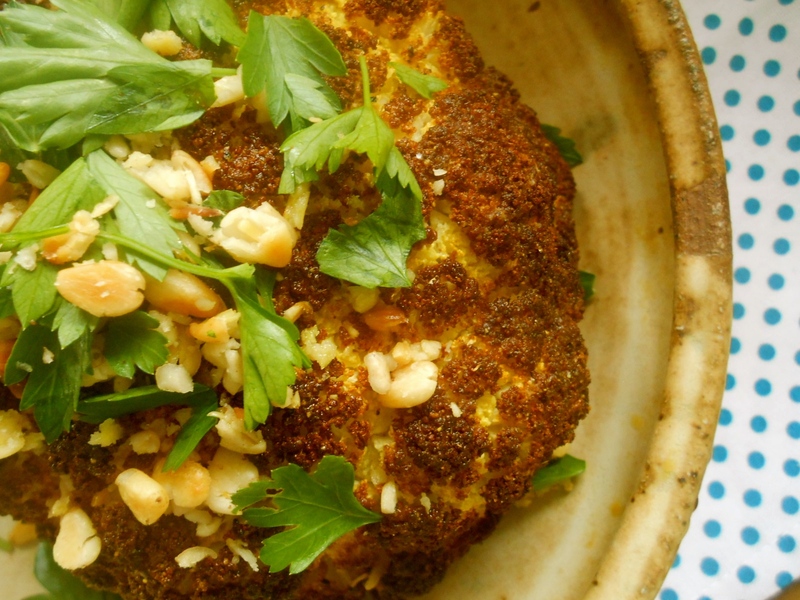 I’ve never roasted cauli whole, I’ll definitely try this, probably tomorrow in fact! This looks to be another winner-winner-cauli-dinner! :D I’ll have to put it on my “to make” list! Ha…nice rhyme! You are too nice because I know you tried my other cauliflower recipe and yet here you are eager to try the next one. :) A true blogging friend indeed. Honestly, I can never have enough cauliflower in my life. I feel like its an underappreciated vegetable…but its versatility never ceases to amaze me. This looks fantastic and I’m going to make it …certainly something my little ones would love! Yes..a cauliflower revolution is afoot! Hi Seana – your opening sentence made me laugh because my first reaction was the opposite – I was like “wow yet another cool thing to do with cauliflower”- great recipe, I will add it to the list to do once the price of cauliflower comes back down – its recently gone up from $3-4 per head to more like $6-8! I can’t believe cauliflower is that expensive there! Where do you live? Really it is – in Sydney! I, for one, think there can NEVER be a shortage of things to do with cauliflower. Please don’t tell my Mom since I once had to sit and eat a whole head for lunch after refusing to eat the small floret I was meant to eat the night before dinner. Oh good…we think alike. :) Unimaginable to have to eat a whole head of cauliflower as a child! School of hard knocks and tough love. Good to hear it didn’t ruin your palate for cauliflower. The spices sound delicious. You can never have enough cauliflower recipes! I agree, never enough cauliflower recipes. :) Thanks so much for visiting! I don’t ‘do’ cauliflower but I think you may just have sold me on it! Must be super impressive to serve a whole roasted cauliflower to the family Seana – talk about making an entry! Love the spice mix and also the sauce to dip chunks of the cauliflower into – really sounds delish! The guys were really impressed with the presentation and I have to admit…so was I! And oh my goodness the cream sauce was delightful. Enjoy the weekend Margot! Seana, that is very elegant. Not only does that cauliflower look and sound fabulous, but your mayo-based sauce sounds addicting! Wonderful! The sauce certainly was addicting. The kind where the bottom of the bowl is scraped completely clean. :) It’s so nice to see your comment this morning Mimi. I like how you’re featuring an otherwise overlooked veggie. This roast is perfect. I like to use curry and ras al hanout. Is so good. I like the way you’re eating! Love cauliflower and this sure is an interesting way to liven it up! This looks amazing – I am going to try this on the weekend for a dinner party. This looks so good! I really can’t wait to try it. I love all the spices on it, and then you add the sauce. Yum! 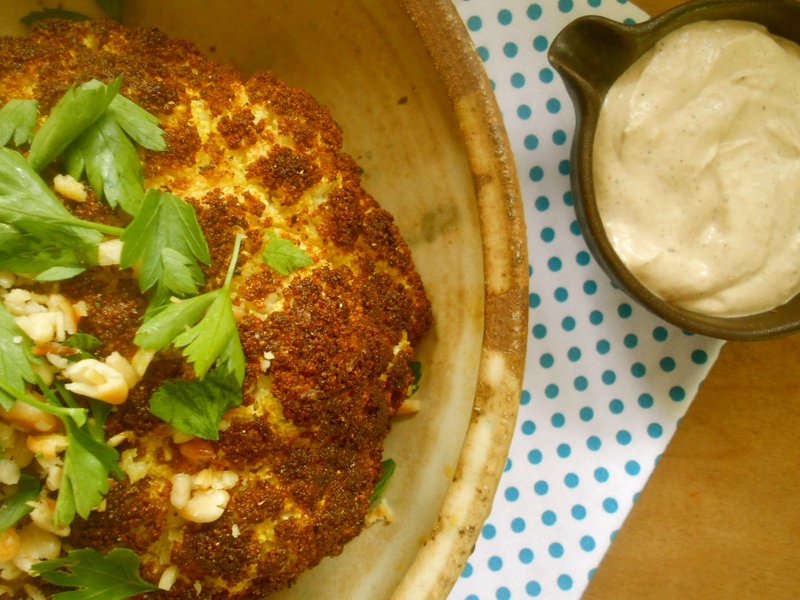 I’ve never seen a recipe where you roast the whole cauliflower, but it sounds brilliant to me! Hi Seana, I finally was able to make a version of this today. Delicious! I added paprika, a pinch of cinnamon and used Kashmiri Garam masala, a spice I recently bought and have using with almost everything lately, even carrot cake! Thank you for the inspiration to use it on cauliflower! Yum! That sounds wonderful! I’m so glad to hear you roasted it “whole”. Hmm, I wonder if my spice store has Kashmiri Garam masala. Thank you for your comment and I really like the added spices you used. Glad it was delicious! I wish I could have taken pictures, but just didn’t have the time today. My son loved it and eagerly ate it for dinner! Kashmiri garam masala is similar to the classic blends, but just a little more intense. I hope you can find it. I’ll try to post more about it ASAP. Thanks again!! I too am a big fan of cauliflower (I’ve actually just posted a recipe for a whole roasted version as well! ), and this spicy recipe sounds fabulous. It’s such a great thing to share at a dinner party, isn’t it? Yes it would be! I haven’t served it at a dinner party and I think I will next time we have guests over. I’m headed to your post now, I’d love to see your whole roasted version. Just got a cute little cauliflower. Tonight’s dinner, for sure! You are currently reading whole roasted spiced cauliflower at COTTAGE GROVE HOUSE.